I just loved the paper roses tutorial on here I thought they were beautiful. I decided to give it a try using one of my childs cups for the circle and a 10 pence piece for the little circles to make my template and this is how it came out. I am proud of it seeing as it was my first attempt, so thank you very much. The Paper Roses Tutorial has been such a big favourite on the website and the results from lots of visitors has been amazing. And this one is no exception....it is just lovely and I love the colours you have chosen to use Georgina, and I am not surprised that you are proud of it. I hope you will make many more. Making use of everyday items to produce the template is excellent and just goes to prove that you don't need any fancy tools to get stunning results. 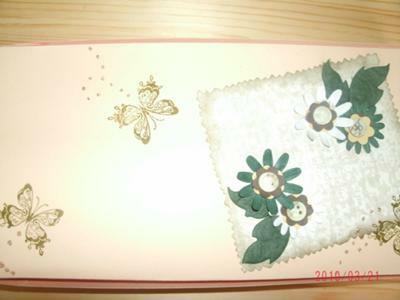 The Gift Envelope can be found in the Easy Projects section and is very easy to do. 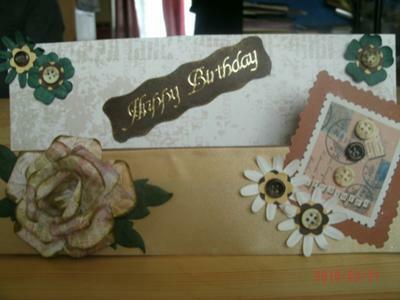 One sheet of A4 card can make this lovely item. And what a lovely way to give a money gift or vouchers ... much more civilised than just handing it over! Especially nice for a wedding gift. There are many more projects in both < b> and don't forget to look in the Papercrafts pages too as there are lote of ideas to keep you busy. Have a browse through all the links in the NavBar to your left. 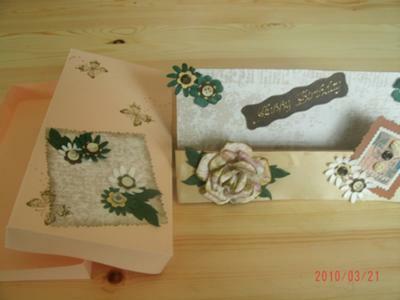 Rose card and box. This is the first time making the box for me, hope you like it. Whenever you make a card you will always be faced with the problem of what to send it in to your recipients. Is it going in the post or will you give it by hand? When you have the answer you need then you can set about the correct thing to put it in. But whatever you use it doesn't need to be plain and boring. Decorate your envelopes with dry embossing that won't add any height or weight to your card. Or stamp an image onto it, perhaps using the same character that is on the card. 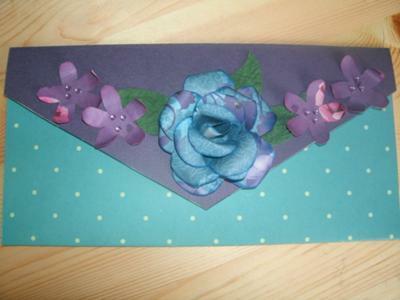 Heat emboss some flourishes to the envelope, or stamp some pretty flowers. But if you want to add the card to a box then you will find Making Boxes in the Video Tutorials in the NavBar to your left. Adding some decoration to the box will always make it extra special, but perhaps not a good idea if it is going in the post.